85% of companies say business partnerships are vital to growth (according to BPI Network), so it’s vital to measure and manage these relationships effectively. But how do you measure these strategic partnerships to ensure mutual satisfaction and to get the most value from the partnership? This requires a two-way feedback approach which reflects the two-way nature of the relationship. Let’s first look at exactly what we mean by partnerships, because it’s a term that’s thrown around by different companies with lashings of abandon. Use the table below to decide for yourself what sort of relationship you want with your customers and what you have now. There’s no right or wrong – each type of relationship will be perfectly suitable for certain types of business. But it’s a big problem if your promise is for partnering when what you are doing in reality clearly isn’t! As the tried and true saying goes, ‘you can’t manage something you don’t measure’. Most measures of the effectiveness of partnerships are lag indicators, like financial outcomes and internal metrics. One of the most proven lead indicators of partnership effectiveness is what people in the partnership are feeling right now. If the partnering you do has a culture of common purpose, shares risk and reward and works as a deep embedded collaboration, then there’s no better way to build a successful partnership than to see it from both sides. If you’re really serious about partnering then your measurement or feedback program needs to mould itself around what’s special about partnerships – in particular, the two-way nature of these relationships. In this example a logistics company has a deep partnership with a national telco (one of three pivotal customers of the logistics company). The telco had been pressing the company to show how it’s partnering approach met best practice. They use Partnership MirrorWave to reach deep into both sides of the partnership, from corporate, right through to the stores and all the people on the company’s side who deal with them. Only three simple questions were asked, so it wasn’t at all onerous for the people participating. A surprising positive. In a difficult business like logistics you’re dealing with the negatives when things go wrong, and it’s not easy to see the positives. They were surprised about how positive their telco client actually was. Internal/external gap. People inside the logistics company thought the relationship was a lot less effective than the telco people did, which can cause problems in a two-way relationship. For example, the perception of not being appreciated or not delivering on your side of the agreement, can drive counter-productive internal behaviour. As a result of the feedback, the company really focused on closing the internal/external gap, working on why they were so negative and what they could do to be better partners. When the going gets tough. While they were good partners in many situations, when things got difficult the company tended to go into one-way mode, rather than behave as partners. While there were quite a few easy operational and communications fixes which immediately improved effectiveness, the internal/external gap was identified as a deeper work on. 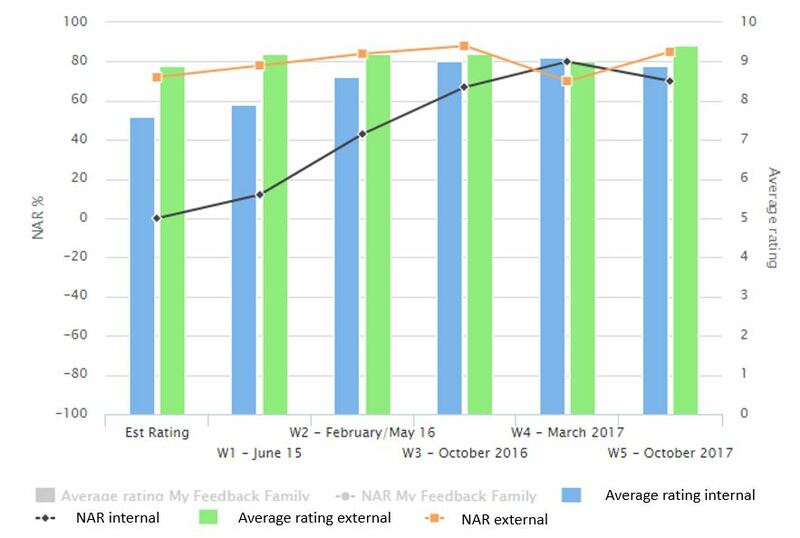 As the table below shows, after several waves of feedback over a period of two years, the internal/external gap has been closed – the result of a much more positive internal partnering culture at the logistics company. If two-way partnerships drive your business, you need a two-way feedback program to really unlock the value of the partnership. Following this approach shows true commitment to successful business partnerships, can unlock illuminating insights and ensures both parties are travelling on the same path to achieve the partnership’s goals. Alternatively, please get in touch to find out how you can set up a two-way partnership feedback program, or read more in our Partnering Whitepaper.